So on Monday night I took a handful of my junior kids outside for some environmental awareness training. This was a very important training session for the juniors who hadn’t done anything like this before. Cries of “This is the best class ever! !” were heard often. I had them perform basic reps standing barefoot on stones, running sprints in the parking lot and some up close and personal self defense training. One of the things we worked on was the need for environmental awareness – and I’m not talking about the effects of leaving trash around or recycling your plastic bottles. Of course I’m referring to being aware of your surroundings, identifying exits and how you can use the environment to your advantage. 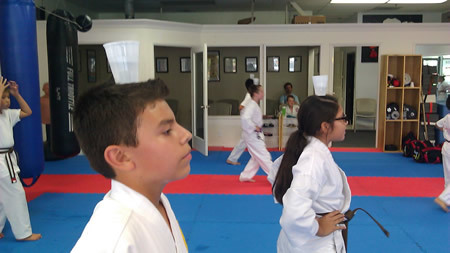 We did plenty of different exercises that helped them become more aware of the things they should watch out for like sharp objects, stairs, dead-ends, etc. Below is a quick video I shot for you with the kids doing a simple self-defense drill were one person is the aggressor and the defender moves inside the line, blocks the incoming technique, strikes and projects their partner into the wall. Maybe next time I'll have them do it in regular street clothes or wearing heavy jackets... these are just other ways to make the exercises a little more realistic. “Excuse me? Could I get some information?”, someone else asks. These and a hundred more things distract students during training. 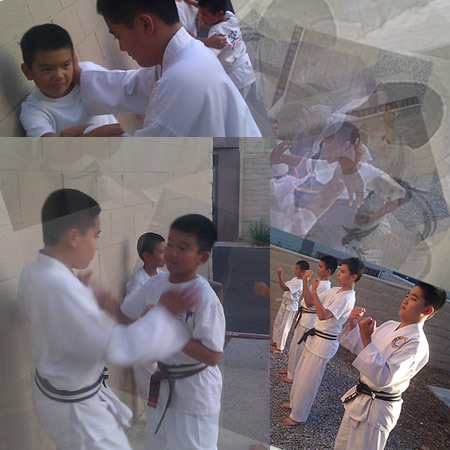 One of my pet peeves (and I dare say one of yours too) is when students lose focus during kata practice. But the good news is this happens a lot less than it used to… AND if you can relate to what I’m saying, I’ve got some things you can try to help refocus your students. Let me interject for the briefest of moments. Is it just me or does there seem to be a disproportionate amount of ADHD these days? Sure, some kids seriously have a condition that needs attention. But then there’s this condition I like to call SYOB which is very similar to ADHD, but it doesn’t require medication or any special treatment. SYOB – simply stands for Six Year Old Boy or Seven Year Old Boy. That’s it. They’re boys. They’re visual learners. They’re easily distracted. No medication required. Just need to be taught to correct their action and refocus. However, when combined with PPS (Poor Parenting Skills) SYOB is often misdiagnosed as ADHD. Perhaps you’ve seen it too? Back to the task at hand. Now where was I? Oh, that’s right – distractions and how to refocus our students. So how do you do it? Well, one option is you can YELL! A well placed yell with an equally loud double clap every now and again causes a PATTERN INTERRUPT, which breaks the behavioral pattern of your student. Once you have their attention, simply and kindly remind them to concentrate, to look straight ahead and focus on what they’re supposed to be doing. Consistent yelling however is really a low level solution that causes long term negative issues. Use it sparingly (and without anger attached). Another option is to HIT! But you know, striking your students isn’t typically good for business. Again, it’s a low level solution that embeds negativity and resentment. Of course part of training requires body conditioning, but there’s a time and place for that. Striking your students across the knee with a stick doesn’t make them want to bend it further. Probably a good idea to steer clear of this one. My favorite method is to CHALLENGE! Yep. The concept is to challenge your students. 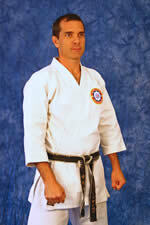 Have them WANT to excel through various karate drills and exercises that promote this notion. One such exercise is to have students do their “line work” with a cup of water on their heads. Yes, real water, in a cup, on their heads. Concentration is a must unless you want to get wet! This exercise provides both positive and negative incentives. Positive incentive is to BEAT the challenge. Negative incentive is to avoid getting wet. Plus it’s fun. Just make sure you have a mop and towel handy. This is a lesson that has a BIG impact on your students. They’ll remember it. And because of that, you can always remind them to “focus like you did when you had the cup of water on your head”. Give it a try and see if it helps refocus your students. And as for PPS, sorry but I can’t really help you. Remember, that’s why THOSE kids are in your program in the first place – to learn discipline and respect.